After what seems like a long time in the IPA and sour ale desert, the chosen style for the next highly-contested Wyeast Employee Homebrew Challenge has moved into a different wheelhouse, so I dusted off this old chestnut from the logbook and propagated some lager yeast. Inspired by Schlenerkla Helles from Heller-Trum, which is actually brewed without any smoked malt – allegedly just picking up the woodsy, bacony phenols from the environment. Which could work in the rarefied air of Bamberg, with hectoliters of Marzen and Ur-Bock flowing like amber beechwood-smoked rivers in the dreams of some Franconian analogue of Homer Simpson. Me, I use 10% Rauchmalz. As pictured before my packaged entries, the final product came out gold with perhaps a very faint hint of orange – from the slightly-darker Rauchmalz – and a stark white lacing. The nose has a strong suggestion of smoke, while in the mouth the sweet, phenolic smoke flavor takes turns with the pastry-dough sweetness of Pils malt and Carafoam to stand out front. Maybe a hint of hop spice lurking around the edges. Nice, full mouthfeel but with a dry, clean finish. 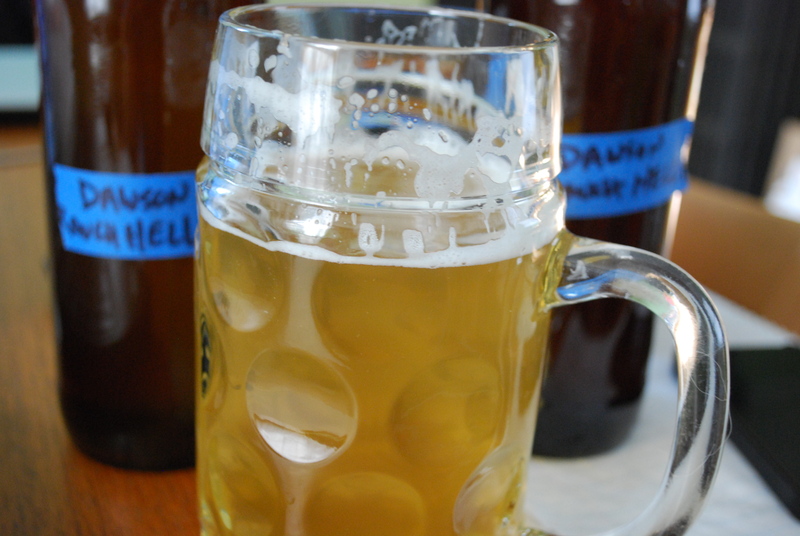 This entry was posted in homebrew and tagged Beechwood smoked malt, first wort hopping, German beer, Helles, Hersbrucker, lager, lager brewing, pils malt, Rauchbier, recipes, Schlenkerla, smoked beer, Weyermann by MD. Bookmark the permalink. I suspect you will win gold in the Homebrew Challenge! Coincidentally, I had Schlenkerla’s Urbock this past weekend for the first time. I really enjoyed it (as I wont to do with Schlenkerla beers). However, I got an interesting tomato note which I’ve never gotten in a beer before. It wasn’t bad, I just wasn’t expecting it in a beer. Is this common? Is it a flaw? FYI – I wasn’t the only one who was getting the tomato note. The two other people tasting it with me also detected the tomato aroma. Good to see you back in action, Mr. Dawson! The tomato note in Schlenkerla Urbock isn’t ringing any bells for me – fruit, or vine? It can be associated with DMS, but that would be a bit surprising given how dark that beer is. Was it poured through a tap that recently had a tomato beer on? I’ve perceived mid-color malty beers give a distinct tomato juice or tomato soup note when heavily oxidized. It’s a very common descriptor for oxidized red wines, less common in beer. But when I do pick it up in beer, it’s in beers with a malt profile similar to Schlenkerla Urbock. The Schlenkerla Urbock was straight from a bottle. The tomato note was that of fresh tomatoes just picked from the garden. It could have been oxidation. I picked up the bottle from a wine store sell much beer. The bottle could have been quite old. No sign of a bottling date. On a different topic, by any chance are you guys going to bring back 1217 any time soon? Mike, glad to see your posts gracing my RSS feed again after too long an absence. I think the Schlenkerla Helles gets its smoke character from the yeast – it’s feremented with a re-pitch of the yeast collected after fermenting their very smoky Marzen. Have you messed around with smoking your own malt yet? I picked up a pellet smoker doohickey for cold smoking malt, but so far all I’ve used it for is cheese & nuts… I’ve found when I brew a classic rauchbier using Weyermann rauchmalz as 100% of the base malt, it’s just not smokey enough for me; it’s not as smokey as Schlenkerla Marzen. This is why I want to smoke my own. I have had some tasty beers brewed with others’ home-smoked malts, but have not ventured into that endeavor myself – my smoker is still just the domain of the pig, and sometimes the cow. I think this is possible. I brewed a decently-smoky Rauchbier with 20% Briess cherry-smoked malt and WLP860 (Munich Helles), and repitched that yeast into a few other beers. I definitely perceived a smoky note in the subsequent beers, which eventually went away after several months of lagering. One more comment: one could up the smoke character by titrating in liquid smoke, but YMMV. I found your blog after watching Chop and Brew (loved you guys on BTV). I received some cherrywood smoked malt as a gift and had a question. As someone who has never had a smoked beer what % would you suggest in a porter? Or, is there another style you would suggest for a first timer? Cheers, Jon – the cherrywood smoked malt is very intense, in my experience … a little bit goes a long way: for a porter I’d start with maybe 5%, depending on how much you like smoke. Have fun! Just finished up a smoked porter…drankin good. This is version 2, scaled up the smoked from 16% to 20% and 1272 vs 1056. Me gusta a lot. Dude, I too have made this style, a couple times. My first one was inspired by exactly the same thing you were. I was also somewhat surprised to learn it gets the smoke character with no smoked malt. Interesting comment above that it might come from the yeast. I like your word painting of smoked beer running in the rivers. Looks like I used about 20% smoked malt and my conclusion was that I could have even increased that to 30% to get closer to Schlenkerla. I am looking forward to trying yours! What are your thoughts on wyeast 3868 Canadian/Belgian Ale? How does it compare to the other Belgian Strains (I have used 3787, 3711 and 1762 in the past)? I find it to be more phenolic than any of the other ones you’ve listed – seems to play well in dark and/or strong worts. Let us know what you think if you brew with it! I’ll be brewing with it in a couple days and will be splitting the batch between it and one with 3787. I’ll let you know how it turns out. 3846 – Aroma – strong fruity notes on the nose, getting some banana and vanilla there as well. Taste- chocolate flavors are stronger than 3787, but banana and vanilla flavor are the prevailing flavors, the flavor of the candi sugar seems come through especially compared to 3787. Compared to 3787 it seems like it accentuates the flavors of the beer more. Thanks, Jamie – the 3864 version sounds like a nice beer! I’ve done 20% in porter and my notes say when the last one went the smoke was in the background (1 year old). I’ve done 34% in a rauchbier and wanted more smoke when it was at a year old. I’ve done 33% in a rauchbier and it was perfect till the end about a year later. I’ve done 45% in a rauchbier and it was a lot – almost too much. I aged 1/2 – 5 gallons and drank it at two years old and it was more drinkable. They all were good fresh and aged but I have to be in the mood for them. Another note I have is to make sure I don’t make these over 5% abv because they seem to go down rather quickly when I’m in the mood for them. I’ve always used Weyermann smoked malt and the malt seems to be a consistent smoke level. WLP830 is my preferred lager yeast. I think it’s Wyeast 2124 Bohemian Lager Yeast. I find that people seem to either hate them or love them. Yep – they seem like a binary proposition for sure. I’ve done a grist that was 100% of the Weyermann beechwood-smoked malt, but I may be a deviant … although I don’t enjoy peated or some of the other smoked malts as much as that one, personally. Thanks for the comment, JD! Sounds quite delicious, Mike. I just brewed a trio of smoked beers: Porter (w/juniper berries), Rye, and Wheat. Smoked my own malt (pale) in each case: Applewood for the Porter, and Beechwood for the Rye and the Wheat. I’ve done the Porter before, and it came out very nice (IMHO). We’ll see how the Rye and Wheat come out…. This looks amazing! I love smoked beer. As I am in Australia the temps here are high at the moment. In my house its a stable 21-25c is it possible to brew this same beer with an ale yeast? As I currently do not have the option to use a larger yeast. Outside in the shed the temps can go from anywhere from 10 – 30 During the day so thats not an option. Hey Nashr – sure, I’d suggest subbing a clean-fermenting/low ester-producing ale strain, and have at it. Let us know how it comes out for you. I just stumbled across this blog after being a long time fan of you and the gang in BTV and Chop and Brew! Glad I found it. The reason for this chance discovery is that I was searching for a tidbit of information you mentioned in an old BTV episode: What booze did you mix with hot wort on a cold brew day? Cheers! Do you by chance refer to a Hot Scotchy? 🙂 (so Scotch, or any whiskey would also work). That’s it! Hot Scotchy! Thanks Don O! Don O is right, although a pedant would say it needs to be Scotch and not just any whiskey. Me, I usually go for an inexpensive Highland single malt or a blended. I’m planning to brew a Honey Mesquite Helles later this month with the new mesquite smoked malt and a small amount of honey malt. I assume it is similar to cherry smoked malt in strength so I should keep to less than 10%. Hopefully this will not be a smoke bomb. Hi Michael! I stumbled on Schenklerla Helles by accident. I was in my local beer shoppe and was randomly picking out helles beers. It is by far my favorite! The smokiness blends perfectly with the aroma of the grain and the cleanliness of the lager yeast. How did you end up doing in the contest? I didn’t see a post about the results.